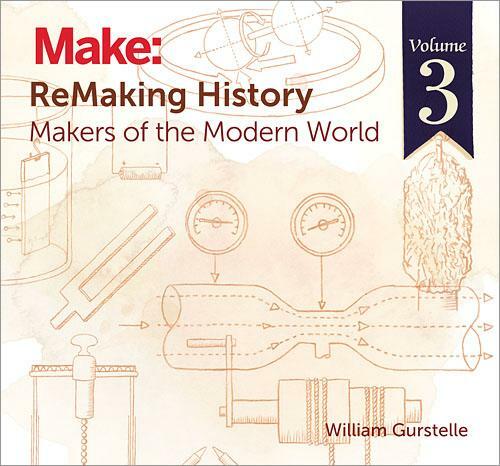 In William Gurstelle's ReMaking History series from Maker Media, Inc., readers get exponentially closer to the inventors who shaped our modern world compared to other histories of technology. This is because Gurstelle doesn't merely tell the stories of remarkable inventors from the past, he gets into their fascinating minds by illustrating how to make one's own version of the inventor's handiwork. The new Volume 3 of ReMaking History bearing the subtitle Makers of the Modern World explores the early modern era and builds on the earlier two volumes covering pre-modern history to the Industrial Age. In this volume, seven inventors and their technologies—destined to fill basements and garages everywhere—include Alessandro Volta and electroplating; Humphrey Davy and the first electric light; George Cayley and the aeronautical glider; the Lumiere Brothers and the movie projector; Rudolf Diesel and the automobile engine; Hans Goldschmidt and the thermite reaction; August Möbius and the Möbius Strip; and Louis Poinsot and loads, moments and torques.